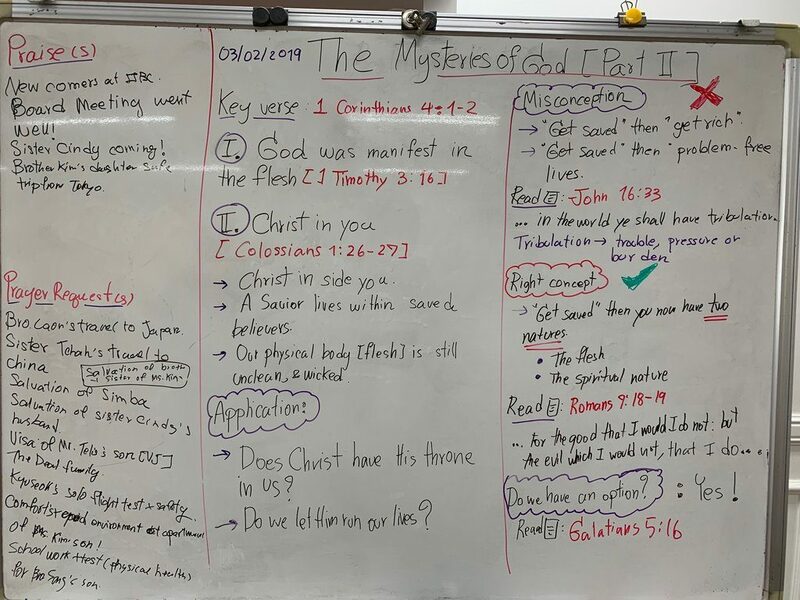 Two weeks ago, we learned about the mystery that God has revealed to us. That is right. The Lord who created the heaven and the earth came down here. He came as a baby boy. He came to die to pay for the sin of the world. Even today, lost people could not understand this mystery. Some reject to believe that God indeed came down on earth and He lived among us over 2,000 years ago. He was crucified, buried yet rose again on the third day. Now He is up there in heaven as a High Priest interceding for us. All right, today will study the next mystery together. Let us go to [Colossians 1:26-27]. Again, we see the word “mystery” appeared here in these verses. If you are saved, the Lord Jesus Christ is inside you. It is called a mystery. The Lord Jesus Christ, as you know, is God. He is sinless. If you are saved, this sinless person [the Lord Jesus Christ] is inside you. A sinless man is inside a sinner. A Savior lives within your old, unclean and wicked flesh that one day will go into the grave. Let us pause here for a while. The Lord Jesus Christ is God. God has a throne in heaven. Now if you are saved, Christ is in you according to Colossians 1:27. Christ should have His throne in you. In other words, He should run your lives. Often, as saved believers, Christ does not have His throne in us. We run our own lives. We do what we want to do instead of what God wants us to do. People have a misconception about salvation these days. They think that if they get saved, all of their troubles will go away. They think that there will be no more life problems. This is nowhere in the Bible! Some get saved, but cancer does not go away. Some get saved, but a marriage life ended up in a divorce. Some get saved, but kids do drugs. These days people have their hope of what is here and now. We need to go back to the basic. Go back to the Bible and be real.Let us read [John 16:33]. Tribulation means trouble, pressure or burden. I was saved when I was 27 years old. That was like five years ago. Back then, I could not find anyone to talk to when I had serious life problems. I was a Buddhist. I prayed to a golden statue. People thought it was a sacred statue. It was just a dumb idol. It could not hear my prayer! However, when tough time comes, if you are saved, remember Christ is in you. The Lord is with you throughout all the troubles. Next, if you are saved, you will now have two natures. These two natures will wrestle against one another until the day you die or when the Rapture of the Church happens. What do we mean by the two natures? They are the old sinful nature and the new spiritual nature. Before you got saved, you can easily justify sin. Once you got saved and when you have done something wrong, you would feel nervous and anxious about it. You did not have a peace of mind anymore. This is your new spiritual nature. Also, it can grow too. If you invest your time in attending Bible-believing churches, reading the Bible, praying and serving the Lord. On the other hand, your sinful nature is also still there. It will always justify sin. Let us read [Romans 7:18-19]. Apostle Paul also faced the same issue. The battle of the two natures. The flesh versus spiritual nature. If we are honest to ourselves, we know that what God said here is true. However, God does not leave saved believers with no options. Lastly, let us read [Galatians 5:16]. Galatians 5:16 ThisI say then, Walk in the Spirit, and ye shall not fulfil the lust of the flesh. Saved believers will have these two natures. So, it is up to you. Will you choose to feed the old nature regularly? Or will you make up your mind today and ask God to help your spiritual nature to grow?